In part 1 I talked little bit about the Master System, it’s history, and what made me consider getting one for myself. At the end I mentioned that I had gotten a Master System, and that I would be talking about my reaction to the system and giving a brief review of it in part 2. Well here we are in part 2. So let me talk a little bit about how and why I got a Sega Master System. As far as how that was pretty easy, between searching my local video game store, and searching eBay I was finally able to come across a system in good condition on eBay. It came with all the necessary wiring, one controller and a few games, and between the price of the system and shipping I was able to pick up a Master System for less then $60. The whole thing arrived surprisingly well packed, and in the exact condition the seller stated. A week after it arrived, I finally found time to hook the Master System up to a secondary TV in my game room I use for this exact purpose. To say the least the system started up and worked flawlessly meaning I had made a good buy. With that said though, let me talk about my actual experience with the system and a few of its games. With all most of my systems hooked up to the large flat screen in my entertainment center, I keep a smaller flat screen around to test new or recently repaired systems. This saves me the hustle of fighting with cables behind the big TV. Just as the Genesis had impressed me with my first play-through of Sonic, Saga’s earlier system had the same effect. 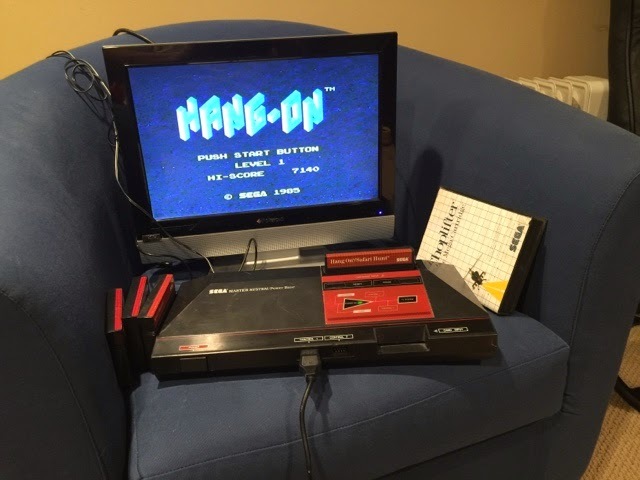 The Master System quickly showed me that it was the “Master” of Gen 3, outperforming the NES and Atari 7800 and to say the least leaving me speechless. What made the difference is that the Master System presented games in a more arcade like manner, with faster gameplay, and more vibrant colors. Comparing Sega’s Hang On, to Nintendo’s similarly themed motorcycle racing game Machrider for instance, we see a more highly developed game with Hang On. Machrider is a fun game and all, and one of Nintendo’s “black box” classics, but it’s slower game play and boxier overall presentation make it look as if it lags behind Hang On by an entire generation. Even an apples to apples comparison of After Burner reveals the same thing, as the Sega version seemed to feel smoother and faster then it’s NES brother and far closer the the arcade experience. As far as the system itself and feeling impressed by it overall capabilities, I have to say it’s design is pretty awesome too. The black and red, stealth jet design made the system unique and definitely gives it a more futuristic feel then its Gen 3 counterparts. Of course considering the NES had a pretty unique and memorable design, and the Atari 7800 was an update of the classic Atari look, design and appearance have very little wieght in Gen 3 besides product differentiation. Much like Atari 7800, and the NES, the Master Systems design also played a major factor in its functionality. For me one of the designs I like the most about the Master System is its controller. Sega unlike Atari made the joypad a standard feature, not just an option or regional feature. With that said though the joypad and console do lead to a dislike of mine. Although the Master Systems joypad has a start button feature, it’s fault lies in that it’s built into one of its two firing buttons, and unlike the NES serves no functionality as a pause button. This leads to a pet peeve of mine that is also an issue with the Atari 7800, whereby one needs to play within a few feet of the console to get full game and system functionality, in this case pausing the game which can be a real problem if you have to put the game down right away to answer the phone, or get to some household matter quickly. Overall though the Master System is a really impressive console, and one I think I will be adding more titles to in the near future. I’ll probably also pick up a copy of Derek Slaton’s The Sega Master System Encyclopedia, which covers all the games for the Master System in detail. If you haven’t heard of it I would encourage you to check out the Gaming Historians: The Sega Master System Encyclopedia Review on YouTube for a fantastic review of that book. As far games go my system came with a copy of Choplifter in case, as well as Space Harrier, Hang On/Safari Hunt, California Games, and Thunderblade all loose. Choplifter looked and played as great as it always does. The highly acclaimed Master System Classics Thunderblade, and Space Harrier definitely lived up to their hype, especially Space Harrier which proved to be as challenging as it is fun. As far as Hang On/Safari Hunt I already spoke about Hang On earlier, Safari Hunt I was unable to play since I neither possess the Sega Master System light gun or a CRT TV. As far as California Games it is fun but an overall mediocre game on all Gen 3 platforms. Of course I did have some additional games I purchased for the Master System before I hooked it up like the afore mentioned After Burner, which I found to be fairly faithful to its arcade origins. I have to be honest and say that the NES is by far still my favorite platform of Gen 3, but the Master System is the better of the two systems.